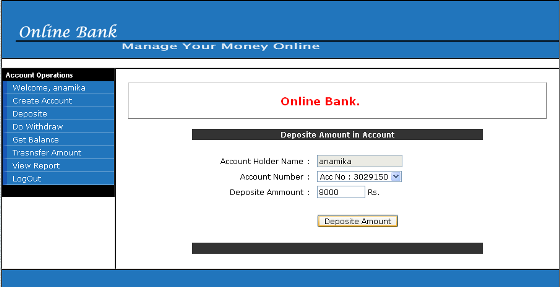 Online Bank Management System is very simple and entry level project developed in java/jsp using jdbc. I have used Microsoft access as a database to store all the details of customer account in a table. This project is a simple project and useful for those who want to learn jsp/servlet with jdbc. 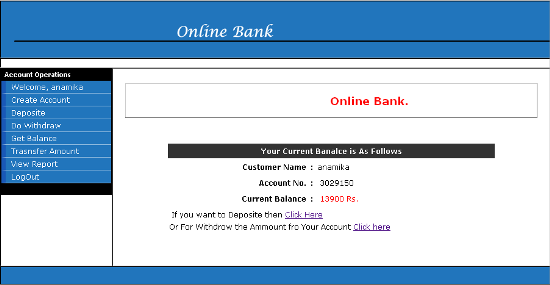 I have implemented most of the feature of online bank in it. 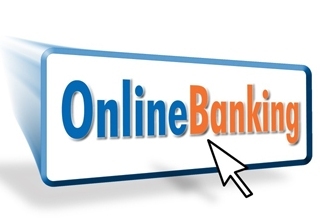 Use can login, Request a Deposit amount, do withdrawal, check his/her current balance, Transfer amount from one account to another account, and view reports of all the transaction. The project is for entry level developer, students, those who want to learn java/jsp. I haven’t use any servlet in this project and database connectivity is written in jsp. Please note that writing database connection or sql statement in jsp is not recommended. 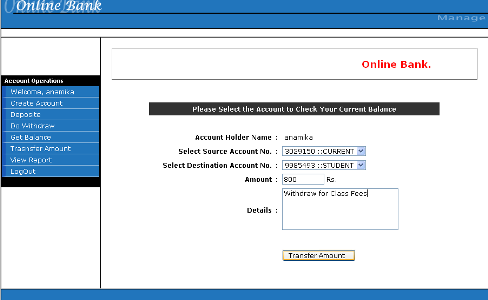 Note: I have uploaded a new PHP version of Online Bank project. If you are interested then please take a Look.